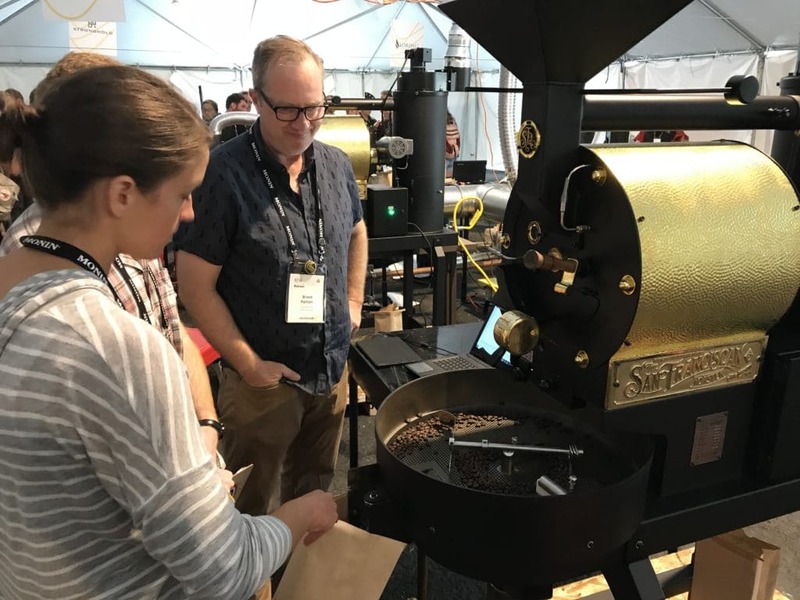 Every year since 2000, the Roasters Guild (now the Coffee Roasters Guild after the unification of the Specialty Coffee Associations of America and Europe) has held a weekend retreat for coffee roasting professionals. The Roasters Guild Retreat provides a truly singular opportunity for coffee roasters from around the United States and world to gather and learn from one another. I had the chance to attend the retreat this year, hosted at the Skamania Lodge on the breathtaking Columbia River Gorge just outside Portland. I had a wonderful experience learning new skills and making new friends, and this post will recount a few of the highlights from the Retreat. I’ve structured my reflections around what I felt were the three main pillars of the experience; the roasting competition, the classes, and the people, and in so doing I hope to provide a window into the incredible experience that is RGR. The Retreat’s schedule is based around a competition designed to expand attendees’ roasting and tasting skills while simultaneously providing an opportunity for creative coffee problem solving. 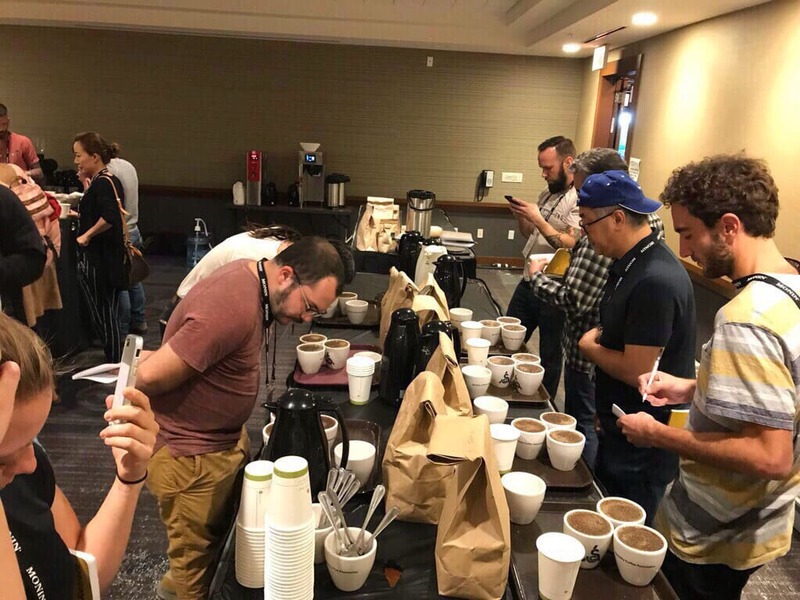 This year, the competition centered on water; on the first night of the retreat, attendees were split into teams and given four coffees to taste with both an SCA standard water recipe and a mystery water recipe. Based on this cupping, teams formulated blend ideas and roasting strategies to use during open roasting time the next day. The goal of the competition was to create the best possible blend by using roasting knowledge to overcome the flavor deficits caused by the mystery water recipe. Roasting took place in the RGR roasting tent, which houses twelve coffee roasters of various size and manufacture. The tent is a definite highlight of the retreat; the chance to roast on a variety of machines is a unique opportunity from which I learned a great deal. I roasted a few of our competition coffees on a Mill City 3kg gas roaster, which handles much differently than our Diedrich IR-20, and learning how to compensate for those differences was a tremendous learning experience. In our initial cupping, my team felt that the mystery water recipe was severely muting the high notes of acidity and sweetness in the coffees as compared to our cupping with the SCA standard water recipe. As such, our strategy for the blend was to roast our coffees relatively quickly with low finish temperatures, with the hope being that a post-roast blend of light and bright coffees would effectively cut through the fog of the mystery water. My team was very happy with the blend we came up with; primarily composed of a washed Guatemalan coffee, the blend also featured a washed Ethiopia and naturally processed Myanmar (both roasted by yours truly). The result was a bright and sweet cup which we felt was extremely well rounded and delicious. We didn’t win the competition, but we all had a great time learning about how water composition affects coffee extraction, and how roasting can be used as a tool to overcome less than ideal water situations. Another crucial aspect of the RGR experience is the slate of courses taught by a team of experienced instructors. I had the opportunity to attend several classes and workshops, with topics ranging from roast style exploration, to how water affects coffee extraction, to a discussion on how to tell stories about coffee producers in effective and respectful ways. Most interesting for me, however, was the class I took on heat transfer in coffee roasting systems. We spent several hours learning about how different properties of a roasting system, as well as the physical properties of different green coffees can affect the rate and quality of heat transfer from a roasting system to green coffee beans. This may sound extremely dry, but heat transfer is an often crucially misunderstood aspect of coffee roasting which has a massive effect on coffee flavor. I learned a great deal about how our specific roasting systems function, as well as how to compensate for and troubleshoot some of the more challenging aspects of our setup. Ultimately, the class was centered around giving attendees a toolset which they could use to identify heat transfer issues and correct for said issues effectively. I learned a great deal, and I think our roasting at Café Altura will be much better for my having attended this class. Last but certainly not least, getting to meet roasters from all over the world was an amazing component of the RGR experience. To be sure, attending classes and obtaining information is an important way to learn, but information only really matters if it has context. Getting to roast, cup, and dine with fellow roasters for an entire weekend gave crucial context to the information we were learning. Speaking about the differences between American and Australian roasting styles with a roaster from Perth hammered home my class on roasting style exploration, for example. Roasting and blending for competition gave life to the class I took on water chemistry, and the numerous causal conversations I had about different people’s roasting setups helped me dig further into what I learned about heat transfer. I gained much more than just roasting skills from these interactions, however; getting to know fellow roasters as people through sharing meals, stories, and laughs was the ultimate highlight of the Retreat. Coffee roasting can sometimes be an isolating profession; not a lot of people know what coffee roasting is, and even fewer know what it’s like to roast coffee day in and day out. The chance to be among a bunch of fellow coffee nerds who understand the daily grind of sourcing and roasting coffee was refreshing, and that fellowship is not something I will soon forget. In conclusion, the Coffee Roasters Guild Retreat was an incredible experience filled with great learning, fellowship, and of course, delicious coffee. It will influence the way I roast coffee from here forward, and I look forward to both continuing the relationships I started there and eventually making it back someday. Stay tuned to this blog for more of all things coffee related. Until next time.